Mix 50% shredded hardwood bark, cedar or shredded coconut fiber with 50% finished compost. Add a 5 gallon bucket of lava sand and a 1 gallon bucket of greensand per cubic yard of mix. Thoroughly moisten the mixture prior to placing it in the bed - very important. Excavate 3” and place 15” of the above mix onto the beds. The entire mixture can be put above ground if it doesn’t block drainage. If it needs to be lowered, remove as little of the existing soil as possible. The top of the bed should be flat and the sides sloped at a 45 degree angle. ANSWER: In an organic program, we fertilize all plants basically at the same time because we are feeding the soil, not force-feeding the plants. And that should make your life easier. The normal times to fertilize in my Basic Organic Program are late winter (now), early summer (June) and fall (October). ANSWER: I hope the beds were prepared correctly when the azaleas were planted. 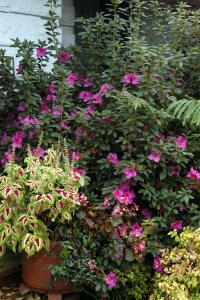 Azaleas should be planted in 100 percent (or close to it) organic material — such as a mixture of compost, cedar flakes and other amendments — with little to no garden soil. If your azaleas were not planted this way, they should be lifted and replanted correctly. Azaleas also need excellent drainage. If the soil and drainage are good, add greensand, dry molasses and products that contain mycorrhizal fungi. All of these products will have application information on the packages.